pt::tclparam::configuration::snit(n) 1.0.2 tcllib "Parser Tools"
Are you lost ? Do you have trouble understanding this document ? In that case please read the overview provided by the Introduction to Parser Tools. This document is the entrypoint to the whole system the current package is a part of. This package is an adjunct to pt::peg::to::tclparam, to make the use of this highly configurable package easier by providing a canned configuration. When applied this configuration causes the package pt::peg::to::tclparam to generate snit-based parser packages. It is a supporting package in the Core Layer of Parser Tools. The command applies the configuration provided by this package to the cmdprefix, causing the creation of snit-based parsers whose class is name, in package pkg with version. 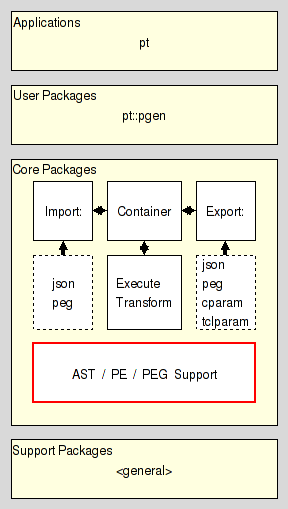 The use of a command prefix as API allows application of the configuration to not only pt::peg::to::tclparam (pt::peg::to::tclparam configure), but also export manager instances and PEG containers ($export configuration set and [$container exporter] configuration set respectively). Or anything other command prefix accepting two arguments, option and value. This document, and the package it describes, will undoubtedly contain bugs and other problems. Please report such in the category pt of the Tcllib Trackers. Please also report any ideas for enhancements you may have for either package and/or documentation.